The archaeological dig which took place at Carnoustie. Tests done on samples taken from a Neolithic settlement discovered at Carnoustie have confirmed it is the most extensive site of its kind in Britain. 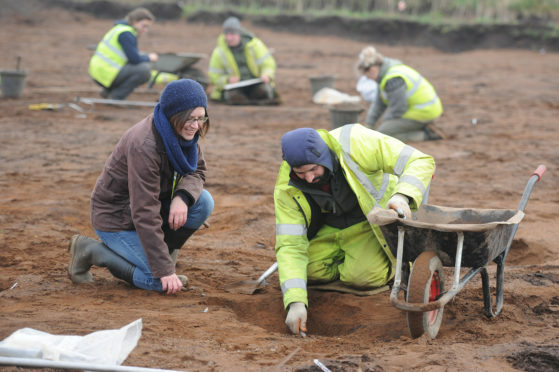 Researchers are painstakingly piecing together the results of radiocarbon dating evidence which has revealed the site, discovered during excavation work near Carnoustie High School, is far bigger and older than previously thought. The evidence continues to throw up more background on the largest Neolithic hall ever found in Scotland, dating back to 4000BC. Experts from GUARD Archaeology Limited analysing the data now know they are dealing with not one but two major site from the final years of the Stone Age. Ronan Toolis, commercial director, said they are currently undertaking post-excavation analyses following their excavation in 2016-17. He said: “We now have 100 radiocarbon dates taken from charcoal recovered from across the site. “The excavation revealed the remains of two large rectangular halls and several smaller round houses. “This new information reveals when these different buildings were occupied. “The two large halls are Neolithic and were occupied at the same time, during the first half of the fourth millennium BC. “The larger of the halls appears to have become disused around 3500 BC but the smaller hall seems to have continued to be occupied until perhaps around 3000 BC. Mr Toolis explained Neolithic settlements are relatively rare so the discovery of a Neolithic settlement at Carnoustie was significant in itself. “The larger of the Neolithic halls at Carnoustie is the largest ever found in Scotland, and indeed the rest of Britain,” he said. “The radiocarbon dates now demonstrate it was perhaps the smaller of the halls that was more significant though because it was occupied for longer. “They also demonstrate the two Neolithic halls lay within a much bigger settlement area. Even more unusual is the fact the two halls were initially contemporary with each other. “This new evidence demonstrates the Carnoustie Neolithic settlement was much larger and more complex than most other Neolithic settlements that have been found elsewhere in Britain and may shed important light upon one of the earliest farming communities in Scotland. The dig discovered a treasure trove of international significance, including a gold-decorated spearhead, a bronze sword and a leather and wooden sword sheath, believed to be the best preserved late Bronze Age scabbard in Britain. Round houses, jewellery and pottery dating from around 2200-800BC were also found.